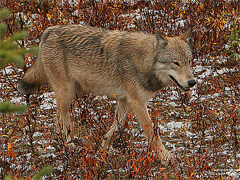 A key meeting takes place this week, on next season’s wolf hunt quota in Wisconsin. The Department of Natural Resources estimates there are a minimum of 809 to 834 wolves in the state – well above the current goal of 350 off-reservation wolves. The Natural Resources Board will consider the quota recommendation when it meets Wednesday in Wausau. “The board is the decision-making body on these issues,” said McFarland. The meeting is open to the public and people can register in advance to make public comment. The quota for the state’s first ever hunting and trapping season was set at what was termed a conservative target of 201 wolves, but only 117 were actually killed. UPDATE: The Natural Resources Board on Wednesday approved the higher quota.